"I like the UWAR for several of my baby boomer/senior clients with limited mobility. 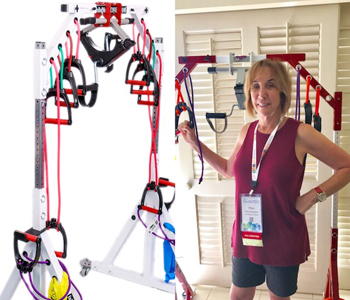 The system provides strengthening and rehabilitative exercises which is great for clients after surgery, too." Risa Sheppard is one of the most sought after Pilates Instructors in the world by celebrities to individuals with life changing injuries. Risa is the creator of the renowned Sheppard Method Pilates, which teaches the mind, body and spirit connection and personal empowerment. She’s dedicated her life’s work to helping others achieve personal perfection and maintain optimal health, no matter what age. Risa received a BA degree from UCLA while working at the Neuropsychiatric Institute teaching creative movement to autistic children. She went on to receive her formal Pilates training education working directly with Ron Fletcher, legendary guru of Pilates, and founder of the Fletcher Pilates® which incorporates Graham-based elements of movement and dance into the equipment-centric structure of Joseph Pilates’ original creation. She is the founder of the Sheppard Method Pilates Studio based in Los Angeles, CA. and the Sheppard Method Teacher Training Program a PMA certified program with successful graduates teaching throughout the world. Click Here for more about Risa Sheppard.